This is a 3-in-one Caldera Cone stove with a difference. This is a 3-in-one Caldera Cone stove with a difference. It can burn alcohol (burner provided), ESBIT fuel tabs in a special holder, and wood in the optional Inferno gassifier insert. The main parts of the stove are made of sheet titanium and will roll up and fit into the mating pot with the other components except the alcohol burner. Major parts fit in Tyvek sleeves and in the mating pot, excepting the provided alcohol stove. ESBIT cooking actually does use about 1/3 less fuel than the best alternatives I've tried. The optional Inferno woodburning insert makes the Sidewinder a TRUE gassifier wood stove that burns most of the gasses emitted in initial combustion. It burns HOT and thus the need for titanium in the outer cone and inner Inferno insert. Thus one can step away from the task of feeding the fire for about five minutes. It's a bit pricey due to the titanium construction. Be prepared to clean pots and stove when burning ESBIT or wood. 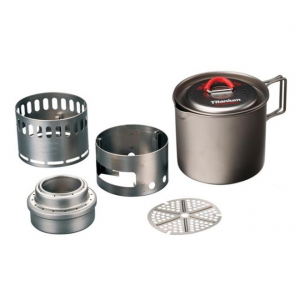 The Trail Designs Sidewinder stove system is a true system. It's called the Sidewinder because you wind or roll up the two cones and ti ground protector and insert them in a Tyvek sleeve which stores in the mating pot. 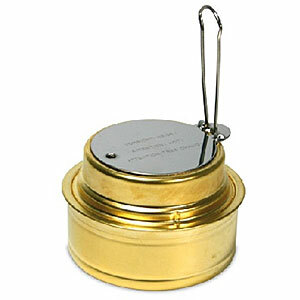 Only the provided alcohol stove will not fit on most pots with the other components. 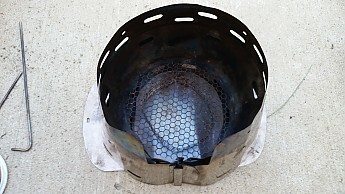 The "whole enchilada" consists of the titanium outer cone, mating pot (various sizes available), alcohol stove, "GramCracker" ESBIT fuel tab holder, Inferno woodburning insert of inverted ti cone, bottom screen and screen stand. The two cones, outer and Inferno inverted cone and ti floor sheet, roll up together and fit into a Tyvek sleeve that nestles tightly in the mating pot. Beneath the rolled up cones lie the woodburning screen and stand in their own flat Tyvek sleeve. Thus the pot interior is protected. Perhaps the best feature of the Sidewinder, aside from its packability, is that it saves fuel in every mode, alcohol, ESBIT or wood. For best results at all altitudes use the provided Trail Designs alcohol burner. They put a lot of time into developing the optimum alky burner. The tiny ESBIT GramCracker holder works with the provided small aluminum ground sheet but I prefer the larger ti ground protector. The Gram Cracker tab holder and outer cone provides, in my own experience, 1/3 better efficiency in terms of fuel needed. * This is a true lightweight long distance stove setup that lets you carry less weight per BTU than alcohol. But for the ultimate in a lightweight stove the optional woodburning Inferno insert is the way to go, especially in winter. No fuel to carry, only tinder. The design creates a double wall gassifier type woodburner that, given the efficiency of the outer cone/pot combo, is a truly light way to go — provided you have the available wood and the permission to burn it. It is a HOT stove and thus the need for titanium cones and steel screen parts. 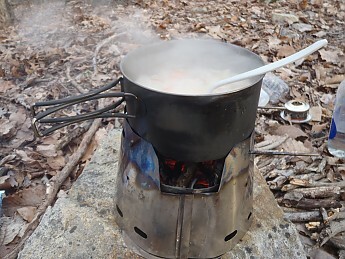 For the winter chore of melting snow for water I use a larger JetBoil pot whose bottom fins fit outside my particular small Sidewinder stove top. This seems to work quite well as the heat-exchanger fins capture heat from the cone's top vents. BUT... one needs to remove the JetBoil pot's neoprene cozy cover before use!! Trail Designs has created a true stove system with the Sidewinder. Did I mention it's efficient in all fuels? 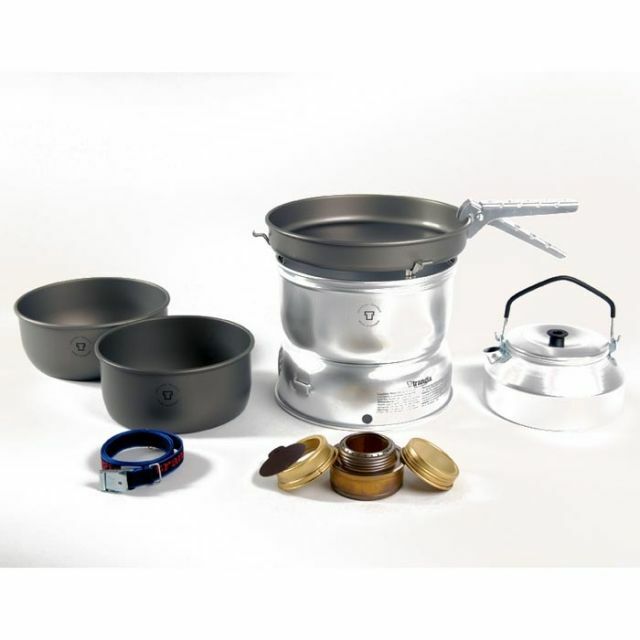 * My previous ESBIT stove was a Vargo TRIAD alcohol stove base and MSR windscreen. This stove can burn ESBIT tabs, alcohol (12-10 alky stove included) and wood with the optional Inferno kit. The ti sheet metal construction is excellent. The Gram Cracker ESBIT tab holder and cone give THE best efficiency of any ESBIT stove. The Inferno insert makes the stove a highly efficient and HOT "gassifier" wood burner that rivals the Bush Buddy. Stove is very light and compact when rolled up for storage. You can set a larger pot on top of the cone and still cook, or set a smaller one on the two provided titanium shepherd's hook stakes run through the 4 holes in the cone but you will lose some efficiency as the pot only sits down inside the cone about 1/2". 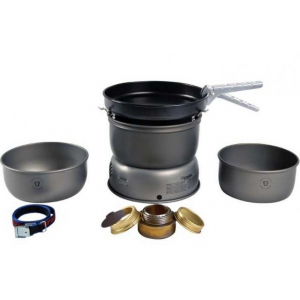 For solo backpacking I bought the smaller 3 cup stove to fit their 3 cup anodized aluminum pot. It's perfect for cooking for one and it is about the maximum size and shape for efficient ESBIT cooking. After years of trying to make a more efficient ESBIT fuel tablet stove I experienced ESBIT "nirvana" with the Sidewinder's Gram Cracker tab holder and cone stove. ** And now, with Brian Green's modded Gram Cracker tray all the liquid residue from the burning tablet is held in the tray to burn, ALMOST DOUBLING THE BURN TIME! (See "Brian's Backpacking Blog" for details). 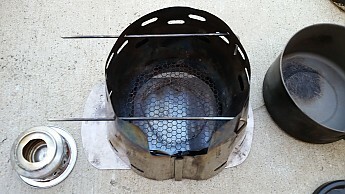 The combination of the Caldera Cone and Brian Green's modified Gram Cracker ESBIT tab holder makes this stove much more efficient in terms of fuel weight (for trips more than 3 days) than any of the alcohol stoves that can be used in the Caldera Cone. If Trail Designs' titanium Sidewinder (and larger TRI-TI stove) were just very good in one of the 3 fuels it burns that would be reason enough to buy it but it is better in all 3 fuels. BRILLIANT! I love the versatility of this stove, 300winmag. Great review and update! Thanks Daniel. Trail Designs seems to work on perfecting its products all the time. Soon I'll attach photos to this review (and to my new Tarptent Moment DW solo tent review as well). I just updated my review from 2014 and noticed that I never voted up your review, which helped me decide to buy this great stove. Thanks again...still the best piece of gear I own! After more than three years of constant use, I can confidently say this is still my favorite stove and piece of gear that I own! The light weight, versatility of fuel types, and heating efficiency of the Sidewinder Ti Tri have exceeded all my expectations. Minor negatives include the multiple-part setup, price, and being sized for one pot per stove. After an initial review in 2014 and a minor update in 2015, I decided to completely rewrite this review as it didn't do justice to this great stove! I could rave on about this stove for hours, but will try to keep it to a couple chapters…as much as I love this stove if you are a simple "boil water and put it in a bag" person then I’ll save your time right now and suggest you go a different direction. However, if you love the camping aspect as much as the hiking part of backpacking, actually “cook” some meals, or just prefer the ultimate flexibility of multiple fuel sources then look no further or at least seriously consider the Sidewinder Ti-Tri! After spending almost 30 years dabbling with canister, white gas, wood stoves, and alcohol stoves I guess you could call me a stove junkie. It would take a lot of time to figure out exactly how many stoves I have owned, but I know it’s more than 10 and probably 20! I retired from the stove collection business in 2014 when I bought my Trail Designs Sidewinder Ti-Tri. 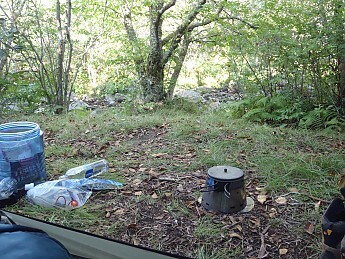 A little background on my approach to backpacking will help with the context and why this stove fits me perfectly. Until the last couple of years, I pretty exclusively made my own meals from stock ingredients or dehydrating at home. Rather than a pre-determined menu, most dinners are a rotation of hearty soups, stews, or pasta dishes with supplemental dehydrated meats, vegetables and seasonings thrown in depending on my whims and tastes on a given day. With the growth of the cottage backpacking industry I began to dabble back into pre-packaged meals (i.e. Packit Gourmet) and now carry at least one of those on a 2-3 night trip for long days where I don’t feel like waiting for food. The trouble with “cooking” rather than just boiling is the weight of the fuel. Hence my conversion over time to a wood burning stove for many trips where that resource was available. I won’t bother you with a review of prior stoves, but safe to say I went through several of each variety. None satisfied my fuel weight vs simmering ability vs fuel availability concerns until I found the Sidewinder Ti-Tri. I purchased the Sidewinder Ti-Tri in 2014 and have carried it exclusively since that time, including trips every month of the year. Conditions have ranged from windy and below 10 degrees F to 80’s and sunny, and everything in between (including 12 plus hour rain events). Most of the trips (I usually take between 6 and 12 a year) were 2-3 nights with a few longer ones up to 5 days. As you can see my top two cooking methods are clearly wood and alcohol. 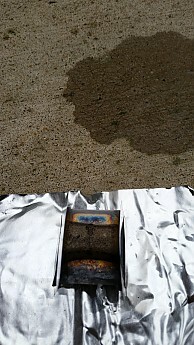 Solid fuel (Esbit tabs) have been used occasionally for testing and a few other times for a quick heat of soup or tea. The Sidewinder is one of the four variations of Trail Design’s triple fuel titanium (“Ti-Tri”) stoves. It is designed for a specific pot (with a wide range of 30 choices) as the cone is both a support for the pot as well as a windscreen. 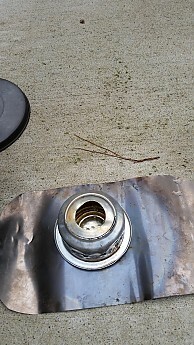 along with a fuel bottle, measuring cup, and two titanium stakes for adjusting pot height for different fuel options. Optional additions include a “leave-no-trace” titanium stove floor (two options—one shown above with the 12-10 stove) and the Inferno add-on to improve the wood burning mode by making it a gasifier/afterburner. The Inferno option includes a second internal cone, a wood-burning grate, and a grate support that raises it off the ground for the gasifier function. Except for the 12-10 stove, everything is made from sturdy titanium. With the vents on the windscreen cone and the Inferno inverted cone, air intake passes through a double wall to heat the air and creates a sort of bellows approach that creates a really hot fire. Due to the variation in pot diameters and optional parts, it is difficult to provide exact specs on weight or measurements from the manufacturer. For my pot (Vargo 1.3 L), the entire system above weighed under 5 ounces. I replaced the 12-10 stove recently with a Vargo Triad (2017 version) but the entire system still comes in under 5.5 ounces. The Sidewinder Ti-Tri is extremely well built. The titanium sheets are very durable and after almost 4 years of constant use I have seen no flaws. 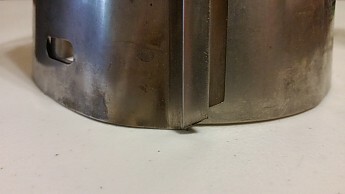 Any creases or bends in the titanium sheets (either the outer or Inferno insert) either make no difference in the operation or are easily reversed with a quick bend. The titanium stake pot supports are also very sturdy—I haven’t bent one yet. 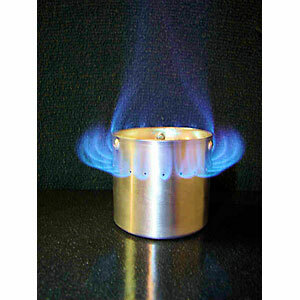 The 12-10 aluminum alcohol stove is as well built as any aluminum pop-can stove. It did suffer a little bit of damage when I almost crushed it with my foot packing up in a rainstorm one day. I was able to repair it in the field, but that did cause me to eventually replace it with a sturdy titanium alcohol stove (2017 Vargo Triad). 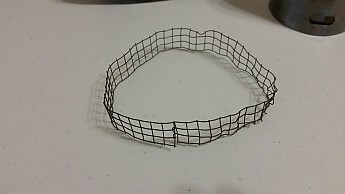 The Inferno grate and grate support are a metal mesh. The grate itself is very sturdy. The grate support is more flexible in order to form the ring support, but so far has suffered minimal damage that has easily been fixed and not affected its function. If it eventually fails I am sure I can make one from some leftover materials in my shed. The Sidewinder Ti-Tri itself is a relatively simple stove system. The titanium sheet easily fits together and that is the basic setup. The grooves at either end slide together and one of them is cut at an angle, which makes it really easy to thread into the other groove. The Inferno insert takes just a little more work—easily forming the internal cone and making a loop from the grate support. Overall, it is quick work to set up the wood-burning stove after a little practice, but some may have issues with the number of parts. 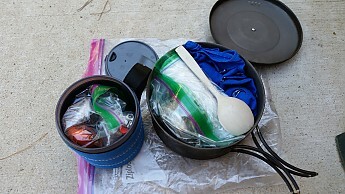 Also, if you are one of those folks who tends to be disorganized and lose things at least temporarily in your pack or campsite, you may want a stove with less parts. I stay pretty organized so don’t have an issue with this. 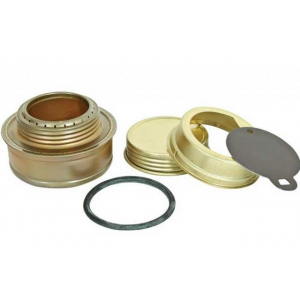 The 12-10 alcohol stove is simply placed in the middle of the windscreen and the titanium stake pot supports set at the lower level. 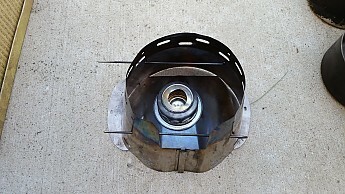 The gram-cracker tab fuel stove can be folded together easily and placed in the cone. No stakes are needed for this option. Each of the three fuel options available with the Sidewinder Ti-Tri work well, and lighting them is at least equal or easier than other stoves of similar types that I have tried. 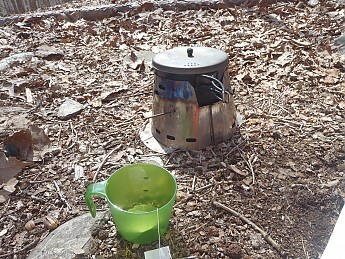 In windy conditions, lighting the stoves inside the cone makes it relatively simple to get going. Obviously, wood burning will take more work than the other two modes to light and get going. 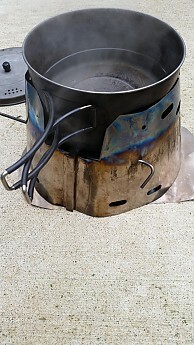 The basic setup with the 12-10 stove lights easily with an igniter. I rarely have to strike it twice to get the flame going. Filling the 12-10 stove is really easy as it has a wide center opening. I have only had to prime with the outer pan a few times in extremely cold weather (less than 10 degrees), but I do keep a 2-ounce bottle of alcohol warm in my pocket in winter. Each time the priming worked well. The gram-cracker stove lights just as easily as any solid fuel stove. 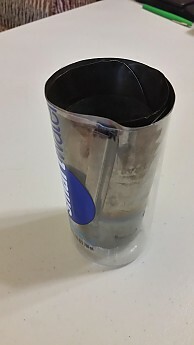 I have had trouble in windy conditions in the past but with the cone wrapped around it is easy as long as you are using a lighter you can get inside the cone with your hand. It is difficult to evaluate the ease of lighting the wood-burning mode as this is the most variable option based on the amount and type of fuel available and your skill in lighting fires. Suffice to say, it has been equal or easier to get a wood stove fire started in the Sidewinder with Inferno than it has been using my older options (Sierra Zip Stove and home-made Bush-Buddy type). The Inferno grate provides air flow that really helps to get the fire going, and orientation of the wind screen with the vents at the bottom can really accelerate this in a breeze. Since I light so many wood-fires in this stove, I tend to carry fire starters to be lazy, but you can easily do this the old fashioned way if you want. The Sidewinder is probably the most stable stove I have ever used or seen. Since the outer cone is both pot support and wind screen, it is close to impossible to knock a pot over when cooking. Even when the pot is at the upper support level for wood-burning mode (above), it is extremely stable. You have to have relatively flat ground to use the stove, but that is typical of most stoves and the Ti-Tri can take a slight slope better than most due to its wide base. The Sidewinder version of the Ti-Tri was designed with packability in mind. The heights of the cones are designed so that the rolled up stove can fit in its pot. 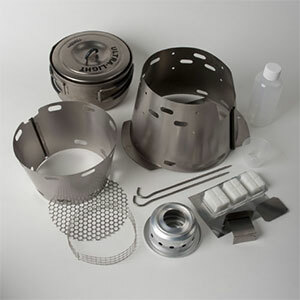 All parts of the Ti-Tri except the 12-10 stove, gram-cracker stove, and Inferno grate can fit into the roll. 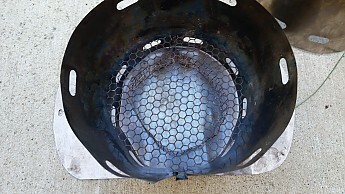 The Inferno grate can fit into the bottom of the pot (in a Tyvek sleeve that comes with it). The stove also comes with a Tyvek sleeve that helps keep the roll in place. If you pack right, you can get all the parts of the stove into your pot…roll, 12-10 stove, and gram-cracker…along with lighting supplies. 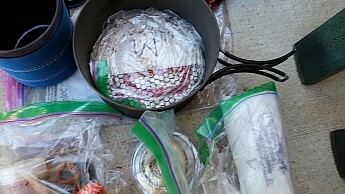 In the photo below, you can see the stove (in its white Tyvek sleeve) in the middle of the pot, the 12-10 stove is on the left (in a plastic bag), and the gram cracker stove is under the blue bandana. The mug has my lighting supplies (more than usual as I was testing firestarters at the time). I have packed the Sidewinder in my Vargo 1.3 L stove and also packed it in a homemade sleeve—a cut off water bottle. Honestly I haven’t settled down to one system yet as I adapt depending on the length of trip and other items I pack with it. In general, I prefer the kitchen to be in one spot so use the in-the-pot approach most often. Some might have a concern about soot from the wood-burning option and residual alcohol from the 12-10 stove getting onto the cooking surface of the pot, but I have found a couple of ziplocs take care of that concern. If that bothers you though, pack these items outside the pot as they still don’t take up much room. The Sidewinder, and other Ti-Tri models, maximize heat transfer from the flame source to the pot. 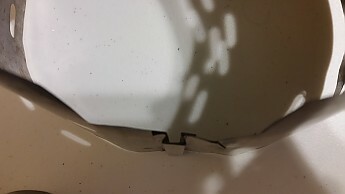 This is due to the fitting of the windscreen/pot support to the rim of your pot. Basically, most of the heat is contained within the cone and transferred to the bottom and sides of your pot. I don’t think you could get much more efficient than that. I often leave the lid off my pot if fuel is not an issue since it is so efficient the time difference is not noticeable. My tests have shown that the Ti-Tri works at least as well and mostly better than similar fuel options. Alcohol boil times for 1 cup of water are under 5 minutes with the 12-10 stove and 6-8 minutes depending on conditions for 2 cups of water. My prior alcohol stove and current one (Vargo Triad) are similar in efficiency when used in the Ti-Tri. 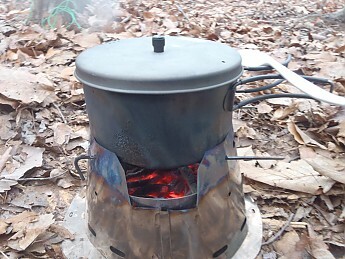 The gram-cracker stove works similar to the couple of other systems I have tried (in the range of 10-12 minutes to boil 2 cups). Take these numbers for what they are worth as I am still dabbling with solid fuel tabs and haven’t quite figured out my best system and orientation of the tabs. Wood burning mode is difficult to assess. 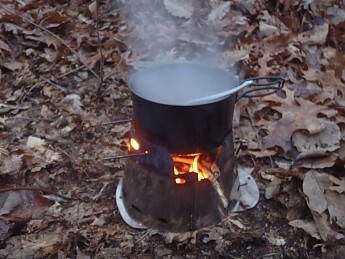 Taking out the variability of fuel and fire building technique, I can get 2 cups of water to boil in less than 5 minutes after the fire is going. I don’t usually time boils when I am getting the fire started as I am too busy having fun with the fire stoking, but in 40 degrees and light wind I noted that 1.5 cups boiled 3 minutes after I put the pot on after the fire got going. Due to the design and integral windscreen, I have seen no drop in efficiency in winds up to 30 mph. However, in high winds I tend not to use the wood burning mode, not due to loss of efficiency, but due to safety and limiting any potential for fire to escape. On a trip to Mt Rogers, Va., I did use the wood burning option in the evening in gusting 30 mile an hour winds as I was in a campsite with bare soil and recent heavy rain, so fire potential was not an issue. With the right fuel picked out from around camp in a couple of minutes, the Sidewinder made dinner a snap. It boiled quickly and then simmered over mostly coals with an occasional boost for 10 minutes. In my primary two fuel modes (alcohol and wood) I have not found a better stove to cook meals. 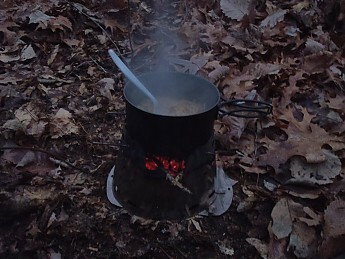 As mentioned in the approach section above, I primarily simmer cook dinners and some breakfasts, and then boil water at lunch, trail tea breaks (above), as well as some breakfasts and dinners when I feel lazy or tired. The multi-fuel capabilities of the Ti-Tri system make this a perfect stove for this approach. I discussed boil times above, but this system really shines with its simmering ability. Usually folks don’t think of alcohol stoves as simmering devices for two reasons: the weight of fuel to simmer and the lack of adjustability or flame control. The Ti-Tri support stakes make simmering over alcohol a really practical option. While it takes a little practice and care, after generating a boil I can quickly remove the pot and move the support stakes to the upper setting (wood burning level above) which reduces the heat of the flame and exposes more of the pot to the ambient air. This setup allows for pretty efficient simmering with just the occasional stir to keep hot spots from burning. The timing of the die down and re-fuel takes awareness, but it’s something I really enjoy. You can't adjust the flame quickly, but with practice you get used to the right amount of fuel to use and when to let it burn down. 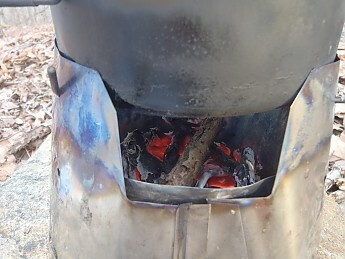 Addition of fuel during cooking is easy as there is a large opening in one side of the Ti-Tri cone, and the support stakes are set at the highest level for wood-burning mode. Being able to ignore the amount of fuel you can slow cook meals, bake bread over coals etc. 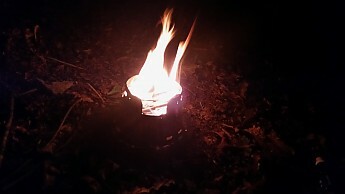 I don’t bake on the trail much, but have often slow-cooked bannock over coals with my Reflectix pot cozy flipped on top. The Sidewinder seems to be relatively fuel efficient in both alcohol and solid fuel tab modes. The 12-10 alcohol stove has similar boil times to other ones I have used and also to times from other testers.Fuel tabs also seem to burn for the same amount of time. Due to the heating efficiency of the windscreen I think the Sidewinder is more efficient in each mode than many other stoves on the market with separate windscreens. Evaluating the fuel efficiency of the Sidewinder can be done for each mode of fuel above, but to take full advantage of the tri-mode fuel approach it must be considered with frequent wood-burning usage. Depending on the trip, I vary my alcohol fuel ration based on weather and potential availability of wood. Many trips, I bring about an ounce of alcohol per day for quick breakfasts and extra for cold weather tea breaks or hot lunches. You can stretch a decent sized fuel bottle for at least a week or two with consistent sources of wood. I hear two very common reasons for not using wood burning stoves from folks—the blackening of hands and pots and the extra chore of gathering wood. I’ll address the first issue later, but under the category of fuel efficiency let’s focus on wood gathering. 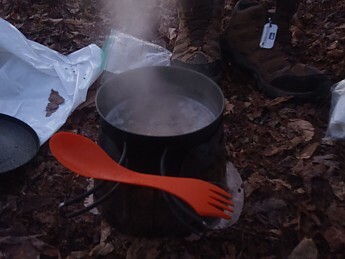 It takes me less than 5 minutes to gather wood (in a relatively forested camp area) for both dinner and breakfast most days. The Sidewinder with Inferno needs a handful or two of finger sized twigs to cook for 20 minutes. Obviously this varies depending on the quality of wood available, but regardless it is easy to find what you need. On days when it looks like the sky is about to open up I keep a plastic bag in the outer pocket of my pack and scrounge some decent looking fuel while hiking. Old campsites are excellent as you can grab old coals which are pretty light and burn for a while. Due to the gasifier Inferno option, you can completely consume the coals and have a great cooking fire in the Sidewinder. The Inferno is so efficient you end up with just a layer of fine white ash at the bottom of the stove. The Leave-No-Trace floor option works relatively well to buffer damage on the ground from the wood-burning stove option, but I have still mildly scorched a small circle of ground on a few nights. It is light enough that a quick brush with a boot makes it disappear, and careful location of the stove (not on top of sensitive vegetation or recent duff) eliminates the issue entirely. I have to address this category for my evaluation of the Sidewinder Ti-Tri. For me, using the Sidewinder, especially with the Inferno insert, is one of the best parts of my day. I have always enjoyed the camping aspects of backpacking and there is something deeply satisfying in watching dinner gently simmer over coals and occasionally feeding the fire. 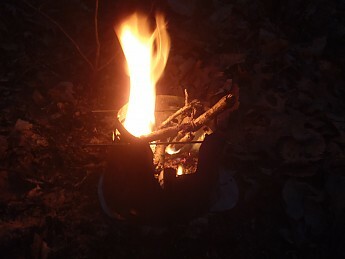 I often keep the fire going on cold nights while I eat dinner by throwing an occasional twig in, then relight it fully for heating water to clean up or for tea, cocoa, etc. Often I’ll keep it lit for a while just for the enjoyment of the fire or a little warmth (you have to sit close to the stove, but it did make a difference when it was below 20°). In fact, since using the Sidewinder in 2014, I can recall building only one fire in an existing ring on a trip with my wife. Another enjoyment factor you don’t realize until you get away from canister and white gas fuel stoves is the peacefulness. There is virtually no noise when using the Sidewinder in any fuel mode (similar to other alcohol, solid tab, and wood stoves) and I certainly don’t miss the roar of my other stoves. If you are a clean freak, then you won’t enjoy the blackening that occurs from wood-burning mode on your pot, and on your hands. 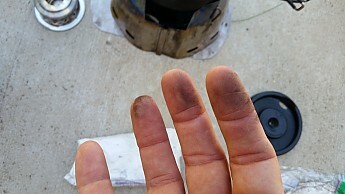 For me, the pot blackening is not an issue and I feel that it helps with heating efficiency, and the little bit of soot that I get on my hands is easily wiped off. Let’s face it—we are not in the woods for a beauty contest (well, except for the scenery) so a little dirt shouldn’t detract from the trip! If you enjoy the flexibility of multiple fuel options, like to simmer-cook some meals, and especially enjoy using a wood-burning stove, you can’t do any better than the Sidewinder Ti-Tri with Inferno insert. After three years of constant use, it is still my favorite piece of gear. If you only boil water or exclusively use one mode like alcohol, then this is a pricey option and you can probably find a cheaper stove that may have similar efficiency. Thanks for sharing your Ti Tri review, FlipNC. I'd love to see a picture of it in action, if you're willing to add that to the review. Thanks for the update and pics, FlipNC. Wow, thanks for all of the updated info in this review, Phil! 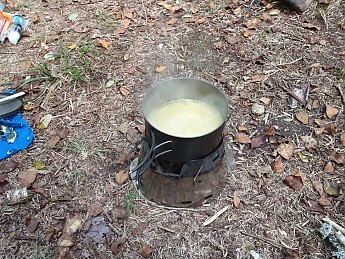 Phil, thanks for the photos which well illustrate this stove's versatility and function. And thanks for the text on the How-To for the stove. It's good for someone thinking about buying this stove to get that insight so they can make an informed decision. This winter I'll once again use the Inferno woodburning version B/C it is great for melting snow. The Inferno version is HOTTT! Ashes are almost all white, indicating the high temperatures possible with this gassifier type stove. TD really thought out this version very well. Thanks. I just got back from a couple of days in the mountains and had about a foot of snow fall. As usual I had stashed some wood in the vestibule and was able to melt snow with the Inferno. You just can't beat that option! I lost my support ring for the grate though ans had to use rocks. Will have to make my own this week before my next trip. The Trail Designs Sidewinder Ti-Tri is not available from the stores we monitor.